Micky Ward is the youngest of a large family. All his life he has looked up to his older brother, Dicky, who once knocked down Sugar Ray Leonard in a fight. But Dicky is no longer the “pride of Lowell”, he is now a drug addict who is supposed to be training Micky in his boxing career. He does, however, have the habit of not showing up when he should, and hanging out in crack houses when he should be elsewhere. And now Micky has a chance to make it in the big time, will his family continue to stand in his way? Based on the true story of “Irish” Micky Ward The Fighter is a really good solid boxing film. Which means it isn’t about boxing at all, but people struggling to make it in life. And Ward’s family are no picnic. And there is the real centre to this film. I have to say that I really really enjoyed this film. Wahlberg’s performance is wonderful. Understated in comparison to the rest of the cast, almost taking a back seat to the supporting cast. But that allows him to really shine in comparison I suppose. Which isn’t to say that the others overact, far from it, Bale is as usual immersed in the role. I’d almost say too immersed, his bald patch is slightly distracting from time to time because you know it isn’t real. The other problem I had with the film was Amy Adams, whom I normally adore. But there is something about her on screen that makes you think her too nice for the role. I never quite bought her as being as tough as the character of Charlene. I can’t point to anything in particular, indeed, she does a very good job, but she just isn’t harsh enough for the role. Especially when put up against the crowd of sisters. Tough women if ever you’ve seen them, although played a little too much as the “dumb girls”. As a drama, a story of one man’s fight with his own family, this works wonderfully. And I really really enjoyed it. But the final fight boxing scene just seemed a little too Rocky-esque. Even more so when you can go online and look at the real fight on youtube. Even allowing for those nit-picky bits this is a great film. And well worth watching. You can see why Leo & Bale got those Oscar nods. I'm really looking forward to watch this one. 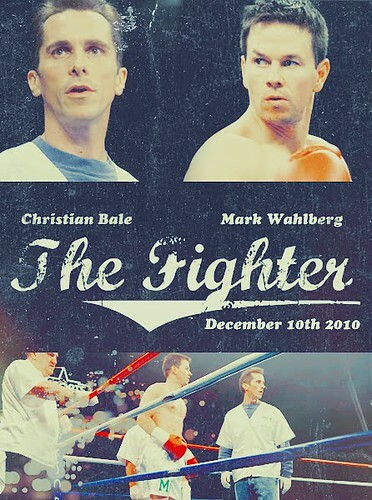 Christian Bale has a tendency of overdoing it sometimes but he still is a good actor and I usually like Mark Wahlberg. Thanks for the link to my review. I did not expect to like this, I didn't even want to watch it but when my brother brought it home we all did. It was so awesome! I mean it was a drama, but I think I laughed more at the women in the family. They were so real and I don't even know how to describe it. Melissa Leo really deserved the Academy Award for Best Supporting Actress, she was excellent, but really all the acting was awesome in this film.